In our time, the historical narratives of conservatism and reactionary discourse imagine socialism as a monolith, but that hasn’t been true since 1914. In fact, the international socialist movement has been shattered by the Great War, with socialist parties still dividing over the question. Some want to support what they see as a fight against holdover feudalism and reactionary forces in the empires of the Central Powers, while many socialists seek greater acceptance of their political parties by taking part in national war efforts, while still other socialists join the pacifists in opposing all participation in the conflict whatsoever. They denounce the Great War as a crisis born of capitalists and empires, so their splintered organizations are necessarily the most radical, and hence the most oppressed. Trade unionists have similar choices to make. In February, ten thousand Glasgow workers conducted a wildcat strike to demand better wages. 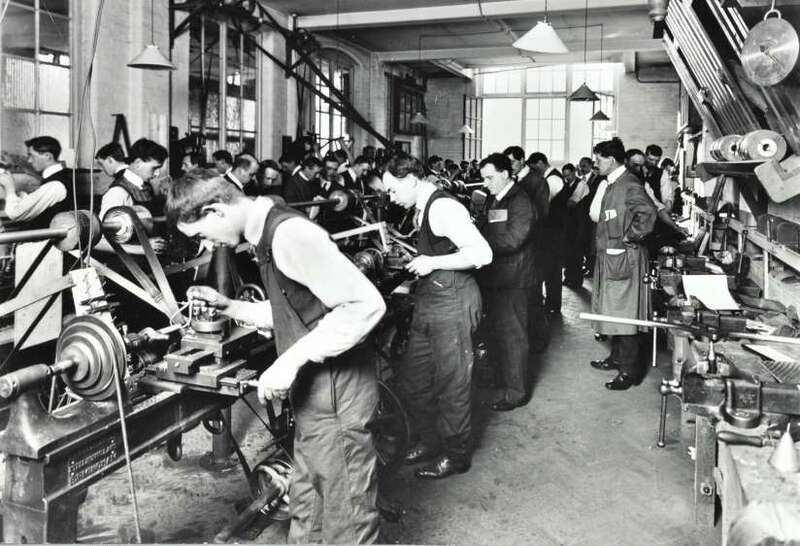 Fearing perceptions of unpatriotic behavior, the Amalgamated Society of Engineers actually joined the call for their return to work. 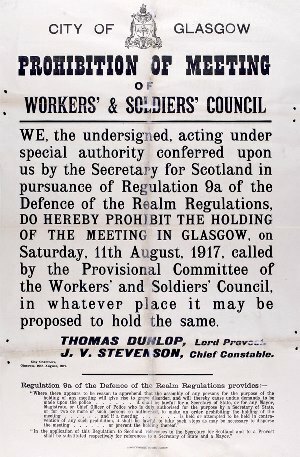 Instead, the strikers formed a Labour Withholding Committee that has since morphed into the Clyde Workers Committee. 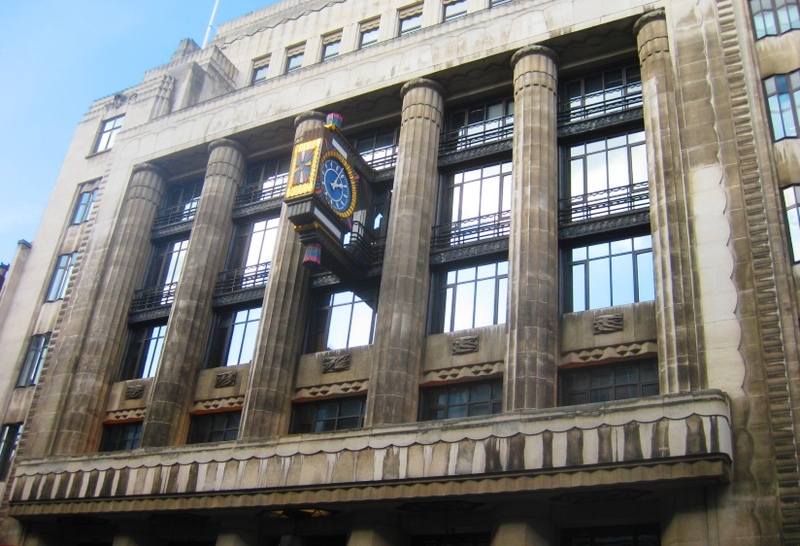 Amid the rebellion of trade unionists against their own organizations, the event marked the beginning of a new ‘shop stewards movement’ inspired by radical syndicalist ideas. The Asquith government did not waste time responding to this threat. Treasury Minister Lloyd George held a four-day conference with the national trade unions in March, during which they agreed to give up strikes and lockouts until the war’s end. 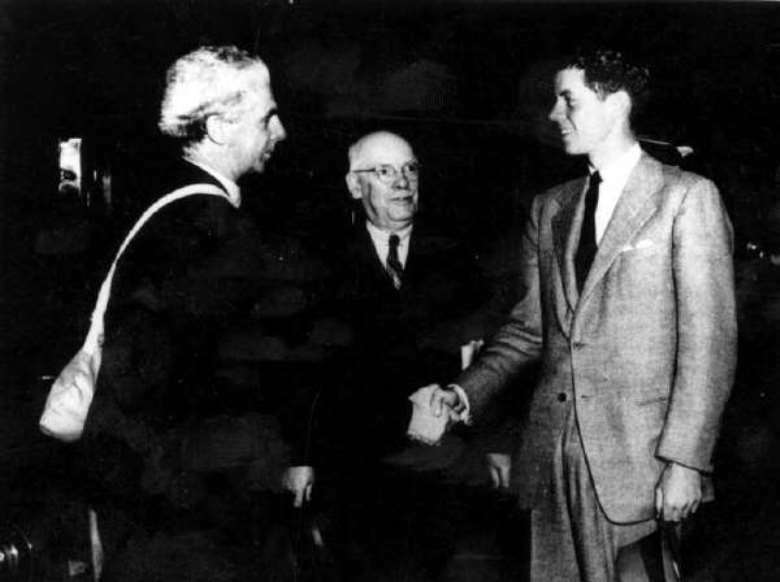 In return, the British government overturned centuries of laissez-faire habits and imposed an arbitration process for wage and work disputes. Shop floors are even being forced to integrate women and unskilled labor into their operations — a process known as ‘dilution’ — so the nation can win a war of production. Thanks to the same new law which makes Lloyd George the Minister of Munitions, for the duration of the crisis it is also now illegal for British workers to strike. Today, Patrick Joseph Dollan, husband of suffragette and pacifist Agnes Dollan as well as the future author of The Clyde Rent War!, writes in the Glasgow socialist newspaper Forward that capitalist price-gouging and mismanagement, not the workers, are to blame for production shortfalls. Contrary to those who blame an imaginary cadre of ‘shiftless’ citizens for not picking up the slack of arms and munitions production, Dollan blames the emergency conditions of wartime. Overtime, when in continuous operation for ten months, does not pay the people on whose job the overtime is being wrought. It goes without dispute that men who have been working every day in the week, and overtime besides, for ten months on end are bound to be fagged, and such men, in my opinion, won’t be able to produce as much per hour as they could in normal times. This fact must be plain to all overseers and to employers most of all, yet they have made no attempt to reduce overtime. Would they allow overtime continuously for ten months if they were not employed on competition contracts? Assuredly not, as it would not pay. Trade Union officials are agreed that the stoppage of overtime and Sunday labour would be productive of good results, and one tradesman whom I interviewed on the point, stated frankly he could produce as much in an ordinary week, prior to the war, as he can now produce in the same time plus overtime. It is this man’s opinion that regular overtime has reduced his efficiency, and it has undoubtedly had the same effect in other cases. While he does not mention Lloyd George in his column, Dollan is undoubtedly responding to the minister’s recent speech before Parliament during which he took his own Liberal Party to task for supposedly protecting this unseen force of lazy citizens. The Great War, and Lloyd George’s career, will eventually bring the end of the Liberal Party, to be replaced by the Labour Party which is arising out of the labor movement; Dollan himself is a member of the Independent Labour Party, which will eventually merge with the Labour Party. Meanwhile, British newspapers are already beginning to refer to the militant labor unrest in and around Glasgow as “Red Clydeside,” for this is not a quiet time in British domestic politics. No law can halt the radical impulse. In Glasgow, one in nine housing units is vacant due to market speculation, with many occupied rental units now dilapidated and overcrowded by a late wave of the British Industrial Revolution’s migration patterns. More than sixty thousand Irish and Scottish citizens arrived seeking employment in shipyards and factories during the previous three years, yet nowhere near that many housing units have been constructed. Glaswegian social activists have sounded an alarm over this growing problem for thirty years, but the interests and influence of the rentier class have consistently nixed all efforts to lobby for new municipal housing, while the huge demand has rather justified the landlord’s rent hikes. 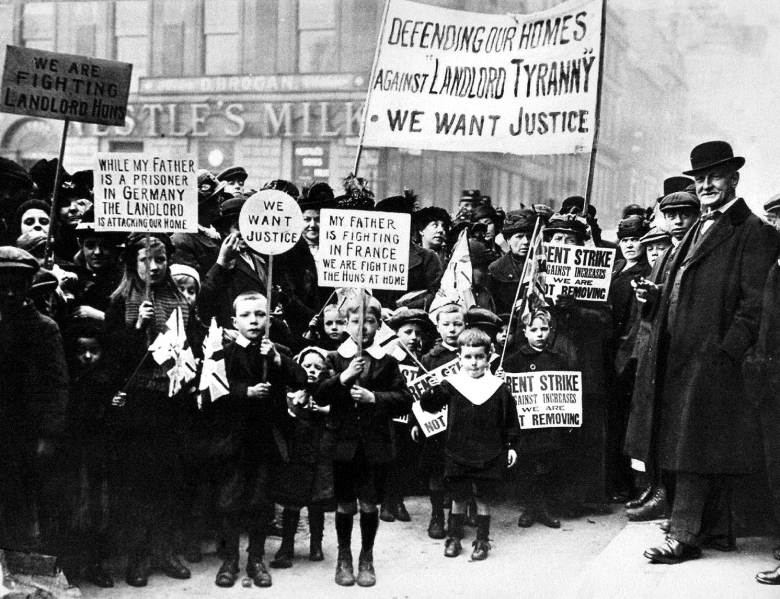 Starting in April along the banks of the River Clyde, the result of this unresolved tension was a series of rent strikes, with mostly-female organizers fending off the harassment and intimidation of rent collectors so that residents could refuse to pay the landlords’ increases. This Summer is seeing huge public demonstrations, for the landlords are turning to the courts to help them evict nonpaying tenants. The keenest scorn falls of those who seek to evict war widows and the dependent families of men serving overseas. 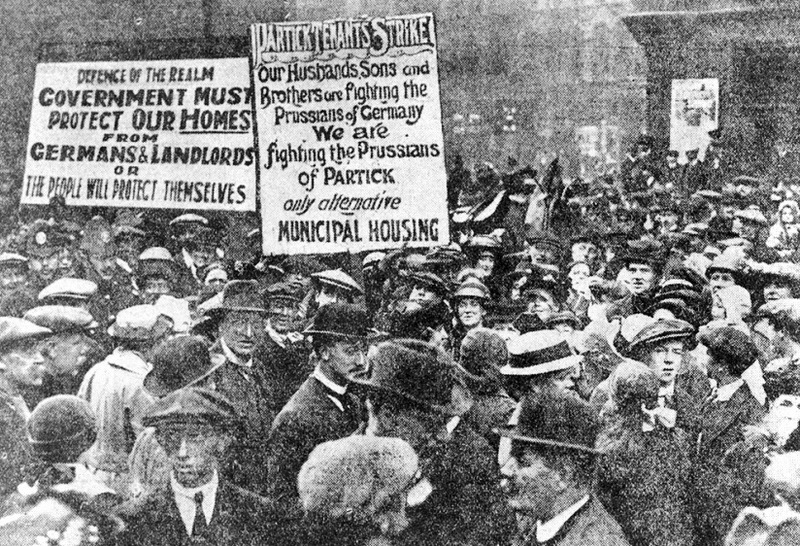 As the strikes spread to every part of Glasgow, more than fifteen thousand households take part by October, and evictions have turned violent. By the middle of November, more than twenty thousand households are refusing to pay the required rent, while demonstrations have grown larger than ever. Finally, under tremendous pressure from rank-and-file members, trade unions threaten to hold factory strikes unless police stop supporting these evictions. The government response is prompt once more: the Asquith cabinet freezes rents at pre-war levels and pushes a Rents and Mortgage Interest Restriction Act through Parliament during December. This working class victory represents another emerging split in radical politics. Even today, there is debate over the nature of Red Clydeside: was it a working class revolution, or was it merely a populist moment in wartime? Our answers usually derive from our opinions of the conflict itself. In 1918, Dollan’s Independent Labour Party will introduce a manifesto calling for living wages as well as justice for veterans and dependents, a progressive agenda that does not directly oppose war itself. Nor does his column today ever actually decry the conflict. Dollan is hardly a fringe character: he will eventually be knighted and serve as Lord Provost of Glasgow. There is a path down which the radical organizer rejects the system, attacks its foundations, and usually ends up on the wrong end of the state’s power; turning down another path, the radical organizer merely looks to make the system work for the powerless, and does not challenge it otherwise. And yet another split is coming. 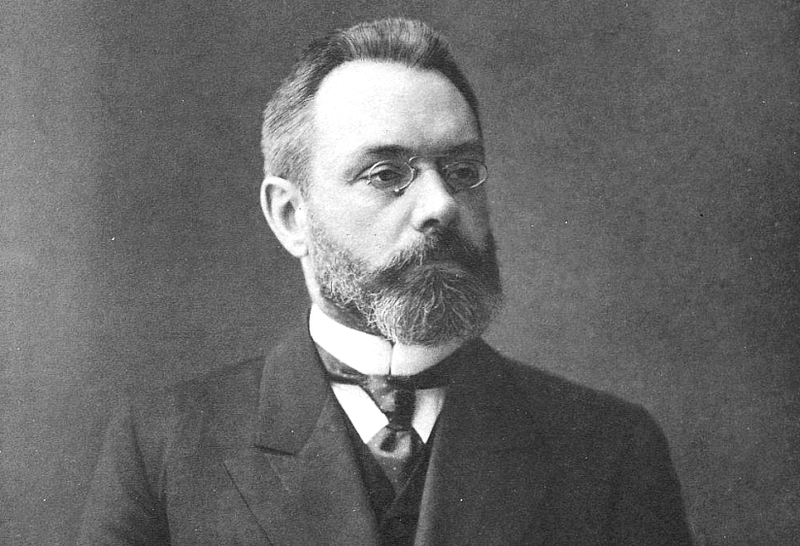 More than two weeks after the Tsar made his decision in private, the Russian War Minister is publicly removed from office today, opening the way for Bolsheviks and revolution. The next question to divide the diverse socialist movement will be whether to support a regime which flies the red flag and calls the workers of the world to the banner of a Third International.